The 2017 Honda Ridgeline has a long list of accessories to add that make it a great winter companion. Whether you’re heading for the slopes on Chestnut Mountain Resort or Raging Buffalo Snowboard and Ski Park, or just on a weekend winter drive, the Ridgeline has accessories that can make transporting ski and snowboard equipment easy, plus other equipment specifically geared to make this winter the best season of the year. Let’s take a look. If you’re planning on participating in some winter sports this season, you’ll be glad to know the Ridgeline offers ski and snowboard attachments that will make transporting your equipment much easier. The Ridgeline also has an in-bed trunk cargo dividers that make it easy to store and organize wet winter gear and transport goods at the same time. The trunk also comes with a drain plug to help make any cleanup process much simpler. Body Side Moldings – protects the doors from being dinged by rocks, chunks of ice, or the tips of your skis. Hood Air Deflector – protects from rocks, ice, and debris. Running Boards – make it easier to get in and out of the Ridgeline, especially when the ground below is icy. Skid Plate – protects the bottom of the engine from debris on the road. Splash Guards – protect the side of the vehicle from mud, rocks, and snow or ice. All-Season Floor Mats – protect the carpet inside the Ridgeline and make cleanup easier. Nose Mask – protects the front-end of the Ridgeline from dirt, debris, mud, or snow. Hard Tonneau Cover – keeps snow out of the box of the Ridgeline and keeps cargo safe and dry. 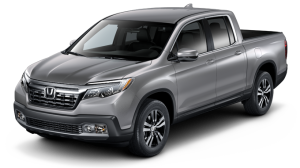 Find out more about everything the 2017 Honda Ridgeline has to offer drivers and get some firsthand experience behind the wheel with a test drive today at any Central Illinois Honda Dealer.